The pumpkin dive is back! The event will run 10-4 at Ellison Dive Park. Divers and non-divers welcome for a action packed day out at the lake. Get your dive knives sharpened its gonna be a blast! 12:00: Dive starts at 12noon sharp! Registration must be complete in order to participate. Pre-registration will help us gauge how many pumpkins are needed and how much food we need to make. Rental gear can be provided if needed- call store for details. P.S Dive club meeting will take place at the pumpkin dive, memberships will be accepted there so bring anybody looking to become a part of the club. We have some exciting announcements so stay tuned! Tag your adventure buddy in the comment section of the video on our Facebook page and follow @innerspace_watersports on Instagram for your chance at winning an adventure package for two (value $200)! No purchase necessary to enter. Tag your adventure buddy in the comment section of the on the contest video on Facebook or Instagram and follow @innerspace_watersports on Instagram to enter. Only one entry per person will be accepted. Innerspace Watersports™ does not accept entries for this contest by any other means. This contest is intended for residents of Canada, excluding Quebec. Innerspace Adventure Buddy Package (Kayak rental for 2, dive gear rental for 2 (**winners MUST have valid PADI, SSI or equivalent certification card for open water diving), discover scuba for 2 or $200 off a snow bike demo for 2. All prizes are valued at $200 and the winner may only select one of the prizes offered). Prize(s) must be accepted as offered with no substitutions is not transferable and cannot be exchanged with Innerspace Watersports™ for cash. Prize will be collected in the Vernon store location and will be valid for 12 months. They will expire September 30, 2018. No contact or correspondence will be entered into except with the winning entrant and affiliate. Innerspace Watersports ™ reserves the right to substitute the Prize with a prize which is in their sole opinion, of equivalent or greater value in the event that any Prize becomes unavailable for any reason whatsoever and/or to change, terminate or withdraw this contest at any time. The decisions of the contest judges are final. The odds of winning a Prize are dependent upon the total number of eligible entries received. Purchasing Innerspace Watersports ™ products does not enhance chance of winning. To be eligible, entries must be received on or before the contest closing date of September 30, 2017 at 11:59pm PST. Contest runs from the date of launch post to September 30, 2017 at 11:59pm PST. This contest is open to all residents of Canada, excluding Quebec, who have reached the age of majority according to the laws of the Province/State where they reside, excluding employees of the Innerspace Watersports, its affiliated companies or subsidiaries, its advertising and promotional agencies, and members of their respective households. Winner must also have a valid Facebook and/or Instagram account. 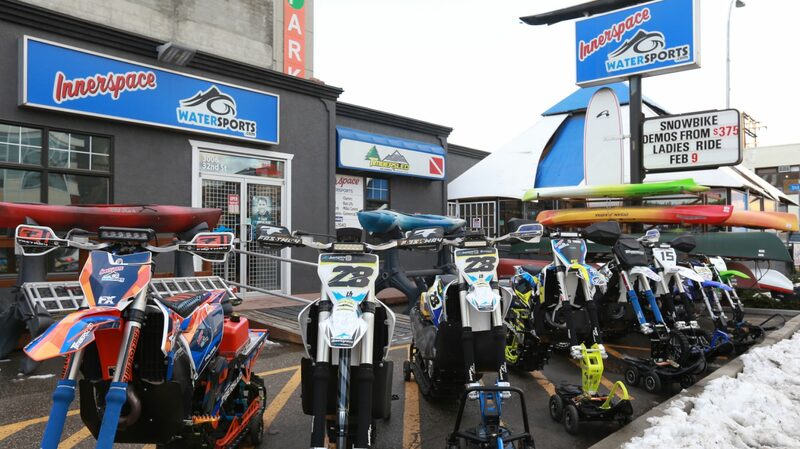 An winner will be chosen for the Prize at the Innerspace Watersports ™ office located at 3006 32nd St, Vernon BC Canada on September 30, 2017 by a Innerspace Watersports™ representative. The selected entrant will be notified by Facebook or Instagram direct message within one business day of the draw. If the selected entrant cannot be reached within two business days, or if the selected entrant does not meet all of the contest rules, another entrant will be selected from the remaining eligible entries. The winning entrant of the prize or, if the winning entrant is under the age of majority, his/her parent or legal guardian, must sign a standard Release form releasing Innerspace Watersports and its directors, officers, representatives, advertising and promotional agencies from any and all liability arising out of, pursuant to, or as a result of the carrying out of the contest including liability arising from the acceptance of and/or usage of or participation in the prizes as awarded and confirming acceptance of and compliance with the Contest Rules. Failure to answer correctly comply with the Contest Rules or to sign and return the release form within 7 days of receipt will result in disqualification and another entry will be chosen. Winner will be tagged in contest announcement post on October 2, 2017 at or before 4:00pm PST. Innerspace Watersports™ reserves the right, at its sole discretion, to change, cancel or suspend this contest without prior notice. Entries are subject to verification and will be declared invalid if they are illegible, mechanically reproduced, mutilated, forged, falsified, altered or tampered with or unlawful in any way. Entries submitted by unauthorised means will be disqualified. In the event that it has been determined that an entry has been made in an manner not sanctioned by these rules and/or an entrant has submitted more than the number of entries permitted by these rules, the entrant and all of his/her entries will be disqualified. Entrants agree to abide by the contest rules and the decisions of the contest judges, which are final. This contest is subject to all applicable laws and regulations. Winner must answer a skill testing question before collecting the prize. By entering the contest, entrants consent to the use of their Facebook names and/or Instagram handle, for publicity purposes in all media used by Innerspace Watersports™, without payment or compensation. Sit-on-top kayaks are the best way to keep your cool this summer! Take your partner or go at it alone, there is nothing better than being on top..of the water that is. Our sit-on-top line starts at 9ft and goes all the way up to 13.4ft with the tandem kayak, but size doesn’t matter right? Jump off and make a splash in the middle of the lake, take your dog, your kid and your friends and have a blast this summer! Fishing versions available as well. To see the full line up click here or call the shop. The BC Snow Show, formerly the Vernon Snow Show, was this year’s highlight for all snowmobile and snow bike enthusiasts. Hosted by the Vernon Snowmobile Association, the BC Snowmobile Federation (BCSF) and Let’s Ride BC, this event’s duration took two days instead of only one. Admission by donation and all proceeds went to the Easter Seals Snow A Rama Kids Campaign. With over 60 vendors and hundreds of visitors, the show turned out to be a huge success. The BC Snow Show, formerly the Vernon Snow Show, is this year’s highlight for all snowmobile and snow bike enthusiasts. Hosted by the Vernon Snowmobile Association, the BC Snowmobile Federation (BCSF) and Let’s Ride BC, this event’s duration is set for two days instead of only one. Doors are open at Vernon’s Kal Tire Place on Friday, November 13th from 05:00 p.m. to 09:00 p.m. and on Saturday, November 14th from 10:00 a.m. to 06:00 p.m. Admission is by donation and all proceeds go to the Easter Seals Snow A Rama Kids Campaign. With over 60 vendors the show is expected to supersede the success of the annual Edmonton Snow. Winter is coming… and Timbersled Snow Bikes are going to roam the mountains like never before. Visit our exhibition at the upcoming 2015 Vernon Snow Show in mid November and check out our latest brands and models of snow activity sports, safety equipment and of course the brand new 2016 Timbersled Snow Bike Conversion Kits. Come and get yours and join us to play up high!